Kate Fuller is an award winning Australian jazz singer and songwriter. Since launching her debut album Tipsy at Bennetts Lane Jazz Club in 2007, Kate has been sharing her voice and stories with audiences all over the world. After studying vocal performance at the Los Angeles College of Music under the tuition of Tierney Sutton, Kate moved to the United Kingdom where she performed regularly throughout Europe, including the Edinburgh Fringe Festival and the Montreux Jazz Festival, before returning home to Adelaide. 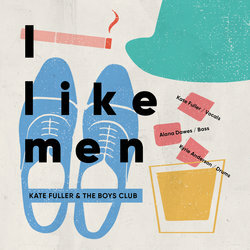 Joined by The Boys Club band (Alana Dawes on double bass and Kyrie Anderson on drums), 'I Like Men' is an exploration of the changing nature of women's relationships with themselves and men, through classic swing tunes of the 1940s, 50s and 60s. This is a uniquely uplifting and powerful feminist song for the swing era, telling the story of a woman who is rising up against being treated poorly by a man. Quite unusual lyrically for a swing-era tune. Written by Fred Fisher for the Paul Whiteman Orchestra in 1928.